Note: In this report I may occasionally use bold print, CAPS, Italics, or word underlining for emphasis. This will be my personal emphasis and not that of the source that I am quoting. Any footnote preceded by a number or letter/number combination in (parenthesis) is my personal library numbering system. Declare that the alleged apparitions to Maureen Sweeney Kyle are not supernatural in origin. Forbid members of the clergy of any ecclesiastical jurisdiction to celebrate the sacraments on the site of Holy Love Ministries (cc. 835, #1, 838, #4). Admonish the faithful of the Diocese of Cleveland to cease gathering for any religious, liturgical, spiritual, or devotional purpose on the site of Holy Love Ministries (cc. 212, #1, 3; 214). Declare that the Confraternity of the United Hearts of Jesus and Mary is not an approved association of the Christian faithful in the Diocese of Cleveland and may not legitimately use the name ‘Catholic’ or represent itself as a Catholic group (c. 216). This decree takes effect immediately. Given at the Chancery of the Diocese of Cleveland this 11th day of November in the year of Our Lord 2009. Some people who have been followers of the aforementioned ministries, messages, etc. have told me they intend to disregard the bishop’s decree and continue as usual. To my knowledge these people are otherwise Catholics in good standing. I decided upon my own to research what Holy Church says regarding obedience (or lack thereof) to our bishops and the consequences. I will follow through by sending copies of this report to those on my e-mail lists, our bishop and Holy Love Ministry. If Bishop Lennon or his designee notifies me that any part of this report is in error, I will notify all readers to whom I have sent it, immediately! First, as usual in my research reports, I refrain from giving my personal opinion, as my opinion means nothing and I lack the credentials to back it (opinion). As always, I stay with quoting Holy Church and related documents directly so that you – the readers – can refer to them if you so choose. With that brief introduction in mind I begin by saying that our bishop must be obeyed! Should we disobey our bishop’s decree we are committing a sin! “No private individual has the authority to judge definitively and officially which private revelations are true and which are not. The authority to rule on the genuineness of a private revelation rests first with the local Bishop. It is forbidden, as well as sinful, to propagate private revelations which have received a negative judgment from the local Bishop, the conference of Bishops, or the Vatican’s Congregation for the Doctrine of the Faith. Some people say, “I’m going to follow it until the Pope says it’s false.” This is a useless guide for action in this matter – very rarely does the Pope make a pronouncement for or against a revelation. Even should the local Bishop mistakenly disapprove of a genuine revelation, obedience to the Church remains paramount. It is a sin to propagate a private revelation disobediently, but it can never be a sin not to propagate one. This applies both to claimed seers and to followers. In fact, if an alleged visionary disobeys a legitimate order from the Bishop, and claims God’s backing for the action, this is a sure sign that the message is not from God. Even if a genuine private revelation has been given, not even God Himself would want or command a seer to spread it against a lawful decree of a Bishop to desist. In fact, there are occasions in the life of St. Teresa of Jesus of Avila (died 1582) and St. Margaret Mary (died 1690) and Sr. Josefa Menendez (died 1923) where Our Lord gave them a directive, but then their superior forbade it. What did they do? They obeyed their human superior on earth. What did Our Lord then tell them? –’You were right to obey my representative.’ On one occasion, the Sacred Heart of Jesus told St. Margaret Mary to do something, but her Superior did not approve. When He came again, she asked Him about this, and He replied: “…not only do I desire that you should do what your Superior commands, but also that you should do nothing of all that I order without their consent. I love obedience, and without it no one can please me. “The entire body of the faithful, anointed as they are by the Holy One, cannot err in matters of belief. They manifest this special property by means of the whole peoples’ supernatural discernment in matters of faith when ‘from the Bishops down to the last of the lay faithful’ they show universal agreement in matters of faith and morals. That discernment in matters of faith is aroused and sustained by the Spirit of truth. It is exercised under the guidance of the sacred teaching authority, in faithful and respectful obedience to which the people of God accepts that which is not just the word of men but truly the word of God. Through it, the people of God adheres unwaveringly to the faith given once and for all to the saints, penetrates it more deeply with right thinking, and supplies it more fully in its life. In St. John’s gospel chapter 17, I quote part of the Prayer of Jesus, “I pray not only for them, but also for those who will believe in me through their word, so that they may all be one, as you, Father, are in me and I in you, that they may also be in us, that the world may believe that you sent me. And I have given them the glory you gave me, so that they may be one, as we are one.” Jesus Himself prayed that we would be one Church under one shepherd. If we call ourselves Catholic, we must live in obedience to our own bishops and be ‘one’ with them. I believe I have said enough in this report although there is enough information available on this subject to write an entire book. If any reader has need of further information, please ask! I end with emphasis on the third point in an old Catholic cliché: Pray, Pay and Obey! This report prepared on November 28, 2009 by Ronald Smith, 11701 Maplewood Road, Chardon, Ohio 44024-8482, E-mail: hfministry@roadrunner.com. Readers may copy and distribute this report as desired to anyone as long as the content is not altered and it is copied in its entirety. In this little ministry I do free Catholic and occult related research and answer your questions. Questions are answered in this format with detailed footnotes on all quotes. If you have a question(s), please submit it to this land mail or e-mail address. Answers are usually forthcoming within one week. PLEASE NOTIFY ME OF ANY ERRORS THAT YOU MAY OBSERVE! DEFENDING OUR FAITH-CONSCIENCE AND OBEDIENCE-SPEAKING PROPHETICALLY OR JUDGING OTHERS? Please, please read this. I never asked you to read any of my previous articles, but please do not miss this… […]– S.G.
Holy Love Ministries is an ecumenical lay apostolate committed to living and propagating the Holy Love, Divine Love and United Hearts messages. These messages which support the two great commandments-love God above all else and love your neighbor as yourself-are given by means of private revelation to Heaven’s messenger. HLM Servants of Holy Love gather to pray the rosary for world peace, for an end to abortion, and that hearts open to Heaven’s messages. I found these links that warn the laity about Holy Love Ministries and Maureen Sweeney. JY member S.G. wrote [on August 8, 2004] that on August 5, 2004, Jesus told Maureen Sweeney that Mary’s actual birthday is on August 5 [and therefore not on September 8 as celebrated by the Universal Church]. The same message is also attributed to Medjugorje which itself is another under-investigation-by-Rome, unapproved and highly controversial “apparition” site. Q: Greetings Brother. May God bless you and your apostolate. I am leery of all Marian apparitions unless the Church has given its approval. My understanding on the alleged messages to Maureen Sweeney in Cleveland that the Bishop and the National Council of Bishops back in 1999 had discouraged people from visiting the site. I have tried to get a reply from the Diocese of Cleveland as to the status of any investigation but my e-mails have been ignored. Do you know of any updates on this site? One thing that raised a red flag for me was a report I found in the web http://www.spiritdaily.org/Our%20Lady%20Apparitions/maranatha.htm that says that this group “Holy Love Ministries” while engaging in Catholic practices is claiming it is ecumenical, thus considering themselves to not be under the jurisdiction of the Diocese of Cleveland. Now I am certain that that is something that Our Blessed Mother would NEVER approve. I have some relatives that have gone to visit the site even though I have relayed all this info to them. They are intent on going because they claim that even at Fatima the bishop at first didn’t believe in the apparitions. A: Dear Charles, I really do not pay any attention to alleged apparitions, seers, locutionists, visionaries and the like. The vast majority of them are not valid. I am with you in a cautious skepticism until the Church makes a decision. The Church says that a good Catholic does not have to believe even the approved apparitions; this includes Fatima. All private revelation is superfluous to our faith and our salvation. Such things might aid our faith, unless we become obsessed groupies, but private revelations are never needed. All that we need to know to live excellent spirit-filled victorious Christ-lives is contained in Public Revelation of the Sacred Scriptures and Sacred Tradition, and in the Church and her Saints. In terms of Maureen Sweeney the only thing I know is that her experience has not be approved as yet. It is best to take any unapproved alleged apparition with a BIG grain of salt until the Church makes her decision. If the report about Maureen Sweeney considering herself not under the jurisdiction of the Bishop of her diocese concerning the alleged apparition there, then we KNOW almost for certain that this apparition is fake. The VERY FIRST test of a genuine apparition is that our Blessed Mother will NEVER go against the bishops, never encourage rebellion, and never lead anyone astray of Catholic Teaching OR discipline. Our Lady of Fatima never encouraged or suggested rebellion against the bishops or try to say that the visionaries were not under the jurisdiction of the bishop. Thus, assuming the report is true about this visionary, comparing the Maureen Sweeney situation and Fatima is like comparing apples with rubber tires. When issues of rebellion and division crop up with an apparition, this is a BIG, VERY BIG red flag. Such a red flag was never present at Fatima, thus it is not a correct excuse to say that Fatima was not approved at the beginning and therefore it is okay to go to this one. That is childish logic that can lead to outright and open rebellion like what happened at Bayside. That Bayside Movement is still going despite the fact that the Church condemned it years ago. We need to look to the Church, not an apparition. Whenever we take our eyes off of Jesus and His Church, we are like St. Peter who was walking on water as long as his eyes were on Jesus. When he looked elsewhere at the storm around him, he began to sink. If we pay significant attention to apparitions rather than the Public Revelation of God through His Church, then we are in danger of sinking. It is a fool’s journey to go chasing after signs and wonders; especially ones that present red flags. Jesus said it was an “adulterous and evil generation that seeks after a sign”. We will be in prayer for those foolish relatives of yours. An alleged site of apparitions in Ohio is under investigation by the Cleveland Diocese, with both the bishop and those who run the site having made the startling declaration that the site is not Catholic, according to Sister Rita Mary Harwood, a secretary to the bishop and lead investigator. The site, known as Maranatha Spring, near Elyria — about 20 miles from downtown Cleveland — is run by an organization which reportedly has told the bishop that because the site is not formally Catholic but rather ecumenical, it may not be under the jurisdiction of the diocese. Prominent Mariologists such as René Laurentin and other priests have visited the site and in some instances have offered what appear to be at least tacit and in some cases ringing endorsements. But the diocese has expressed deep concern, especially about articles such as a special rosary sold at the site, and is preparing a more formal inquiry. “It is not a Catholic ministry,” says Sister Harwood. “It’s ecumenical.” Diocesan officials at the request of the bishop had asked to meet with Maureen Sweeney and her public relations people in 1999. At that time, although they use all Catholic devotions, and it certainly looks very Catholic, they brought a canon lawyer with them who indicated that they are an ecumenical ministry and therefore are not subject to the authority of the Church. The bishop has issued a statement, as well as a statement from the United States Conference of Catholic Bishops. Most recently, asserts the seer, Mary has been appearing on the twelfth of each month in commemoration of Our Lady of Guadalupe, whose feast day is December 12. Sister Harwood said there is not yet a formal ruling that could be characterized as a rejection or condemnation. In recent years similar cases have met with condemnation or rejection in New York, New Jersey, Maryland, Wisconsin, Nebraska, and Colorado. Bishops have remained neutral in other cases reported in Arizona, Massachusetts, Georgia, elsewhere in Ohio, and other states. We take no stand on such apparitions. Our policy is always to obtain the view of the diocese when we are asked about an alleged site, and when there are official statements, to report them, whatever our own inclination. When there is not yet a judgment, we leave it up to the reader’s discernment, as in this case. Maranatha Spring is located in Lorain County, Ohio, on over 80 acres that was once farmland. Lennon’s decree states he “forbid members of the clergy of any ecclesiastical jurisdiction” to celebrate the sacraments on the site of Holy Love Ministries. People have been going to this shrine since the early 1990’s, drawn by founder Sweeney-Kyle’s claim that Jesus and the Blessed Virgin Mary and a host of saints are appearing to her with messages. On the surface, everything about the site appears to be Catholic, but they are not Catholic. They say so themselves. Therefore, this official proclamation by the Bishop will be of little regard to Sweeny-Kyle, or her husband Don Kyle, the director of Holy Love Ministries. This, fellow Catholics, should have been the red flag that immediately exposed the apparitions long before an official proclamation. When in the history of the Catholic Church have approved apparitions consisted of a Blessed Mother going freestyle outside the Church? When has Jesus rejected His own authority — that of the Catholic Church? The final Church proclamation comes as no surprise. The ministry changed locations and names several times and Sweeney-Kyle even changed husbands, divorcing and then remarrying two years later. The organization has been at odds with the Catholic Church almost from the start. It sought approval through official channels for several years, but instead, in 1999, the Catholic diocese issued a statement urging extreme caution. At that point, Holy Love Ministries took an “ecumenical” approach. Yet, as an ecumenical ministry it found time and space in many of its printed materials to rail against the Church. Would Jesus and His Blessed Mother and the saints choose Sweeney-Kyle to give the Catholic Church a tongue-lashing? No way. The question now is, will those that were enthralled with this Shrine, accept Church authority or continue to follow a ministry that has officially been condemned? It’s not wrong to go to a site where purported apparitions are occurring. Catholics must keep their heads on straight and not wander from Church teachings, but praying at an apparition site is not wrong. However, once the Church has condemned a site and declared it off limits to clergy and laity, it’s a different ball game. Then, it becomes a matter of obeying Catholic authority or thinking you know better. “The one who listens to you listens to me and the one who rejects you rejects me; and he who rejects me, rejects the one who sent me,” Luke 10:16. Either we accept the authority of the Church, or we reject it. Those at Holy Love Ministries have openly rejected it. The question now is how will the many followers respond to the Bishop’s decree? I fear that many, enthralled by what they believe to be a miraculous site, will disregard the Church. Consider the options the devil has available to trap faithful Catholics? Such people will not be attracted to obvious evil. So, instead, the devil uses a Catholic facade to lure them in. Then, when God’s authority on earth — the Church — speaks against the fraud, a number of otherwise good Catholics get caught in the trap. In November of 2006, I wrote an article for Catholic exchange exposing the Holy Love site. (http://catholicexchange.com/2006/11/06/94475/ ) After an angry backlash of emails telling me how wrong I was, I promised never to write about alleged apparitions again. In addition, there are a number of followers in the area where I live who were irritated by my observations. My life is stressful enough without stirring up such pots, I reasoned. I am proving, however, that we should never say never . After the Bishop’s decree, I felt compelled to appeal to all Holy Love followers, to accept the fact that the Church has the authority to condemn this site. Jesus told us that the gates of hell would not prevail against his Church and he promised to send the Paraclete to keep the Church free from error. “If he refuses to listen to them, tell the church. If he refuses to listen even to the church, then treat him as you would a Gentile or a tax collector. Amen, I say to you, whatever you bind on earth shall be bound in heaven, and whatever you loose on earth shall be loosed in heaven” (Matt. 18: 17-18). “I have much more to tell you, but you cannot bear it now. But when he comes, the Spirit of truth, he will guide you to all truth” (John 16:12-13). If Jesus were giving messages on “all truth” to individuals, the result would not be thousands of denominations going in different directions. He speaks through His Church. The Church has spoken on Holy Love Ministries. What of the many miracles and increased devotion so many experienced at the site? I did not save all the impassioned emails I received three years ago, but I did find similar comments on a site discussing Holy Love. One woman credited her father’s conversion from a Sunday church grumbler to attending Mass and saying the rosary daily — even two years after his visit to the site. Another person said that her fallen-away Catholic friend that once ridiculed the site became a believer. Someone said that such compelling evidence of positive fruits proves this is from God. No, it does not. That is why we have the Church, so that we don’t get led astray by what looks good on the surface. The Church, guided by the Holy Spirit, always looks below the surface because all that glitters isn’t gold and regardless of how many people visit or how many statues are erected or rosaries said, it does not constitute proof. I once read that people bring their own holiness to these sites. They pray and love God. God answers prayers. All this is holy in nature but is not proof of authenticity of purported apparitions. Too often, after apparitions are condemned people feel betrayed and give up on God and the Church. Then, all their gains are lost. Or, disappointment leads them to reject Church authority thinking that they are right and the Church is wrong. Rather than allow such disappointment to derail them, they can instead take a big step closer to God. By giving their disappointment to God and continuing to walk with him, they acknowledge that his Church is bigger than a single ministry or the claims of any purported visionary. The past prayers and experiences of Holy Love followers were very real. If people were inspired or received what they believe to be miracles at this site, then praise be to God! God can use all things for good. But now the line has been drawn. People can follow Sweeny-Kyle or the Church, but not both. First: to ask that the title Our Lady Protectress of the Faith 1986-1990 be given to the Blessed Mother; Second: Project Mercy 1990-1993 Rosary Crusades against abortion; Third: Holy Love Ministries 1993-Present, Propagation of the teachings of Holy and Divine Love and the Chambers of the United Hearts. Guided by Canon 215 (see below), we do not have any affiliation with a particular Diocese. All people are welcome to come and pray with us for unity in the Body of Christ (Eph 4:4-6). As Canon 216 states that we have the right to promote our Ministry, this obviously includes voluntary fund raising. At the same time, we always encourage people to support their local parishes. Canon 215 The Christian faithful are at liberty freely to found and direct associations for purposes of charity or piety or for the promotion of the Christian vocation in the world and to hold meetings for the common pursuit of these purposes. Click here http://www.holylove.org/pdf/truthful_history.pdf to review a pdf of the chronology that documents the Ministry’s struggles and the unwarranted attacks, untruths and calumnies by Diocesan officials of Cleveland. We congratulate Bishop Richard Lennon on his appointment as Bishop of Cleveland. We’re optimistic he will have a more tolerant view of the Ministry. Previous Bishop Anthony Pilla resigned in January 2006. Maureen explained her situation to Father Kleem by saying, “These words just keep popping in my head, and I don’t know where they come from.” Father Kleem responded by saying, “Those aren’t words, those are divine locutions.” He urged her to write them down in a journal so that they could be read aloud at his prayer group. Because the pastor at St. Brendan’s Church treated Maureen’s visions like far-fetched tales, Father Kleem and Maureen’s followers left the church and started meeting in private homes. The prayer group then adopted the name Our Lady Protectress of the Faith and began a crusade to win ecclesiastical approval from the Catholic Diocese of Cleveland. During this time, Maureen’s husband, Paul Sweeney, was skeptical about the locutions. He was an active parishioner at St. Brendan’s Church and had attended many of the group’s early meetings. Although he was a devout Catholic, he had no interest in becoming more involved with Maureen’s alleged locutions. To resolve this problem, the Blessed Mother prompted one of the group’s members to deliver a message to Donald Kyle, a former police officer, requesting him to join the ministry. By the early 1990s, Maureen was spending more time with Don Kyle than she was with her husband. After asking Don to accompany her on a trip to Florida, Maureen found herself inseparable from his side. Soon after their trip to Florida in the summer of 1993, Maureen moved out of the house and filed for separation. Several months later, Paul filed for a divorce, which was granted in May 1995. Don and Maureen were eventually married in February 1997. During this time, the ministry moved to a home in the Seven Hills area, and after hiring a professional fund-raiser, the ministry began to flourish. It was at the Seven Hills home that the Blessed Mother told Maureen to dig a well in the backyard. The holy spring, which Mary called “Maranatha Spring”, took shape in the form of a red-handled pump on a far corner of the property. After the pump was installed, the pilgrims could fill empty milk jugs with water that allegedly contained miraculous healing properties. In June 1994, about a thousand pilgrims gathered in the Seven Hills home one Saturday afternoon. Pilgrims were spilling over onto the neighbors’ lawns, and traffic was being blocked by several tour buses that were piled up in the street. Four days later, the city of Seven Hills obtained a temporary restraining order against the ministry, and in August 1994, Judge Judith Kilbane-Koch ruled that the group could no longer use the house as a meeting place. Shortly after, Don Kyle started knocking on farmers’ doors to see if they had any land to sell. Several months later, the ministry was able to acquire an eighty-three-acre farm in Lorain County for $350,000. According to the Blessed Mothers’ instructions, they dug a new well at the far end of the property in the middle of winter 1995. The Blessed Mother also wanted the circle of carpeting cut from the suburban living room where She used to appear and have it brought to the new location. Today, Holy Love Ministries at Maranatha Spring continues to host thousands of pilgrims who arrive by bus to pray the rosary and sing “Ave Maria”. Many of the pilgrims have claimed to have witnessed spectacular phenomena in the sky, taken miraculous photographs, and watched their rosaries turn to gold. Others have left the site disillusioned by the million-dollar business complete with a full line of sacred merchandise, everything from twenty-five-cent holy cards to a one-million-dollar commemorative plaque. 3. “Ministry in Lorain County has its Believers and Skeptics” (Cleveland, Ohio) Plain Dealer, September 24, 2005. I wish you, though belatedly, a happy and Blessed birthday on January 4. My attention has been drawn to a “Rosary of the Unborn” that is being promoted by priests at the retreat centre of which you are the Director, and the “devotion” is taken up and spread in other cities by Catholics who make their retreats there, as seen in the following link to a September 7, 2012 blog by Marie [see below] from Mumbai: http://rosaryoftheunborn.blogspot.in/2012/09/rosary-of-unborn-to-conquer-abortion.html*. The initiator of the referred “Rosary of the Unborn”, Maureen Sweeney of Cleveland, Ohio, USA, is the founder of “Holy Love Ministries” which is not only not approved by her bishop but also warned against by him. The alleged mystic refuses to seek Church approval. THE ALLEGED SEER AND HER MESSAGES REMAIN UNAPPROVED AND ARE STILL UNDER INVESTIGATION BY THE BISHOP WHO MEANWHILE DISCOURAGES CATHOLICS FROM VISITING AND PRIESTS FROM ADMINISTERING SACRAMENTS AT THE CENTER. After reading my report, I trust that you will ensure that the “devotions” accompanying this rosary do not receive public approbation from priests at your retreat centre. I look forward to an acknowledgement of this intimation from you and Fr. Michael Payyapilly, VC. Praise Be To JESUS. Brothers and Sisters Lets recognize Abortion as a face of evil and an enemy to world security. We will not have genuine peace until abortion is overturned. Let’s spread devotion to the ROSARY OF THE UNBORN like the enemy (Satan) would spread germ warfare. Let this devotion permeate cities, nations and the heart of the World. When you pray this special ROSARY prayer, you combat war in the Womb and war in the World. 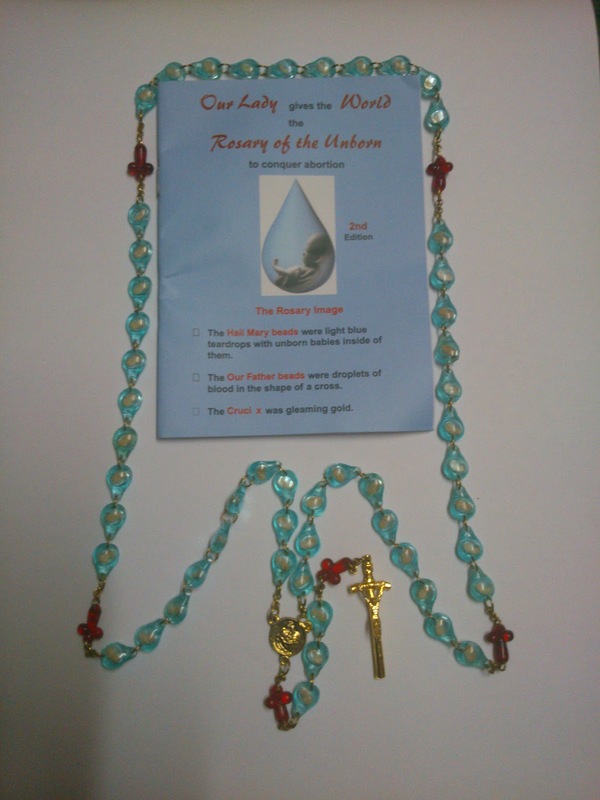 Well, Today I’d like to share with you “The Rosary of the Unborn”. Divine Retreat Centre (Potta) Kerala. And little did I know that this Rosary would change my Life, Would make my life meaningful and add a purpose to my life. Finally I was blessed with a Purpose and Mission to make this known to my fellow Brothers and Sisters. So here I am sharing this message with you all. 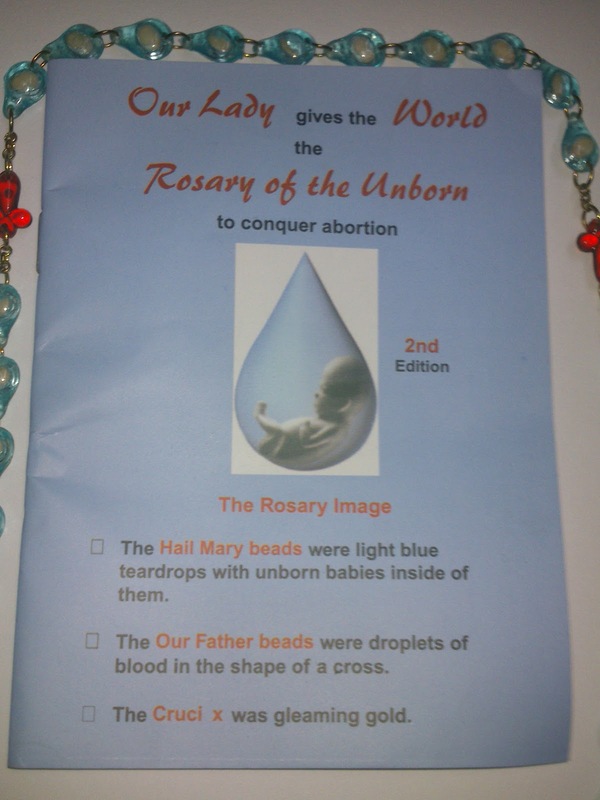 gives the WORLD the ROSARY OF THE UNBORN To Conquer Abortion. Maureen Sweeney-Kyle almost on a daily basis. Maureen is a visionary. She is a very shy, timid and a frail housewife and grandmother from Ohio. In 1993, Our Lady began Holy Love Ministries and then requested that the ministry procure property for a shrine in Lorain County, Ohio. This was accomplished in 1995 (115 acres) and now it is known as MARANATHA SPRING & SHRINE, Home of Holy Love Ministries, an Ecumenical Lay Apostolate to make known to the world the Chambers of the United Hearts. HOW DID THIS UNIQUE ROSARY COME ABOUT AND THE PROMISES ATTENDANT TO IT? 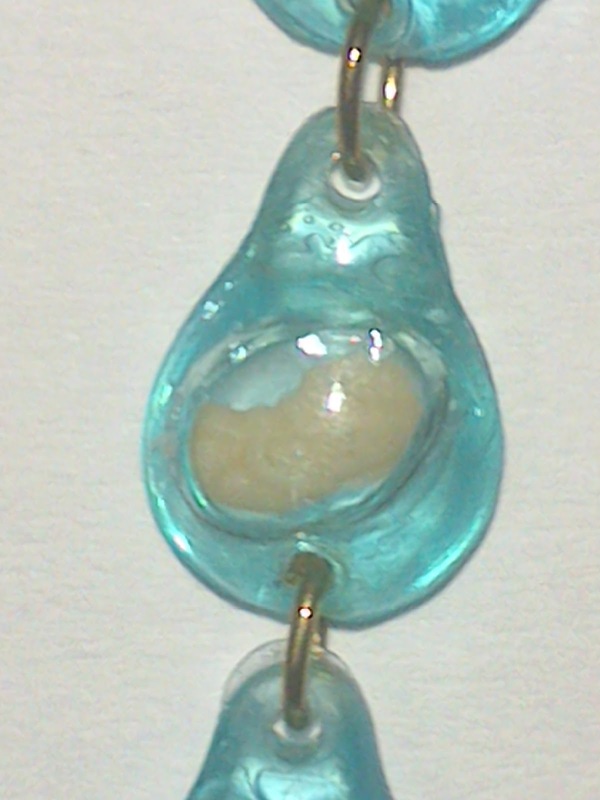 In side the tear drops we have a Small Foetus/Embryo representing the Unborn or Aborted child. Then after the 10 tear drops we have a Red Cross, this Red Cross Represents the Blood of JESUS and the death of the Unborn. that TRIUMPH & REIGN over the evil sin of Abortion. And it has a GOLDEN CRUCIFIX that represents how JESUS died for our sins… How he gave his life for us to save us from purgatory. Well, the visionary Maureen Sweeney- Kyle had many, many visions from our dear MAMA MARY and JESUS but personally this one particular vision spoke about the strength of the BLESSED ROSARY, A HAIL MARY TRULY SAID FROM HEART which I would like to share…. Why is this Rosary so special? 2) A monetary offering in the obtaining of the Rosary — acting as a donation (without the reward of tax donation benefits and credits) toward the needy and pro-life counseling for poor and unwed mothers through the Life Mission Centers. 3) A surrender of your will and a commitment– an offering of love to open the path of righteousness and allow God ‘s Will to be done; to understand and acknowledge that we cannot do things alone and without God. We cannot end abortion for all time without God’s help. “If your nation overturns legalized abortion, I will richly bless it by my favor. Our Lady presented visionary Maureen Sweeney-Kyle with the Rosary of the Unborn and requested that Holy Love Ministries produce the rosary for the world. The Blessed Virgin Mary asked that all people be united in prayer to bring an end to abortion. As the Blessed Virgin explained, heaven is showing us the way to end abortion. Through many trials and perseverance, the initial prototypes were made, and with them, Our Lord and Our Lady revealed the graces that would accompany the Rosary of the Unborn. The Rosary of the Unborn is a sign of hope for the world: that with heaven’s assistance, abortion will end and we will no longer offend God with this horrible sin. It is also in heaven’s plan that many people will be brought to learn about the Revelation of the United Hearts of Jesus and Mary, the Message of Holy and Divine Love, and the truths about the Chambers of the Divine, Sacred Heart of Jesus. A spiritual path is set before us, and through the mission given to Holy Love Ministries, an ecumenical organization, there is a call to ALL PEOPLE to live in Holy Love (to love God above all else and your neighbor as yourself), thus bringing an end to all evil in the world. It is heaven’s desire that the bulk proceeds from the Rosary of the Unborn® will allow for the continuance of the production of the Rosary and assist United Hearts Life Mission Centers, which will clothe and feed the needy and offer counseling in alternatives to abortion to pregnant women. Our Lady comes in white. In front of her and suspended in the air is an unusual rosary. The Our Fathers’ are crosses of drops of blood. The Hail Marys’ are teardrops with unborn babies inside of them. The cross is gleaming gold. I’m Fr. Michael. I read your email. First of all I would like to advice you to get certain facts right before you write an email in which there are accusations involved in it. There were certain things that you have no clue about and have ended making statements in an email based on hearsay or some blog. Which I would say is lack of prudence. And what I do take a lot of offence at is the fact that you have emailed this mail to many people who have nothing to do with this ‘incident’. If you wanted to send it to the Director of the retreat centre then you should have emailed it only to him and not people who have no connection to this at all. It is a shame that you could take the effort to write a whole big article that has pages in it but could not take the effort to get the email ID of the director and send it to him only. I thank you for your prompt response of January 6 to my letter of the same day. There are two parts to your response. In the second part, you say that I have been imprudent in copying to others my letter addressed to Fr. Augustine Vallooran. I had intentionally marked copies to persons in ministry and to ministries that are associated with the Divine Retreat Centre and also use “divine” in their email ids. Apparently, I made a mistake when I inadvertently copied my letter to one particular ministry whose email address is “divinepowerministries@gmail.com” and has no association with your retreat centre. I apologize for that and have corrected my records accordingly. The first part of your letter says that my email was based on “hearsay or some blog” as a result of which there are “accusations involved in it”. Could you please specify exactly what they are? However, I note that you have not denied that during a Holy Mass celebrated at the Divine Retreat Centre [DRC] during an Inner Healing retreat, a priest promoted the devotion of alleged mystic Maureen Sweeney’s Holy Love Ministries’ “Rosary of the Unborn” and that the blogger, Marie from Mumbai, influenced by the priest’s propagation of it, purchased two of those rosaries from one of the shops located on the DRC premises [and is now, in turn, promoting it in the public domain]. There was no response to this ministry from either priest.